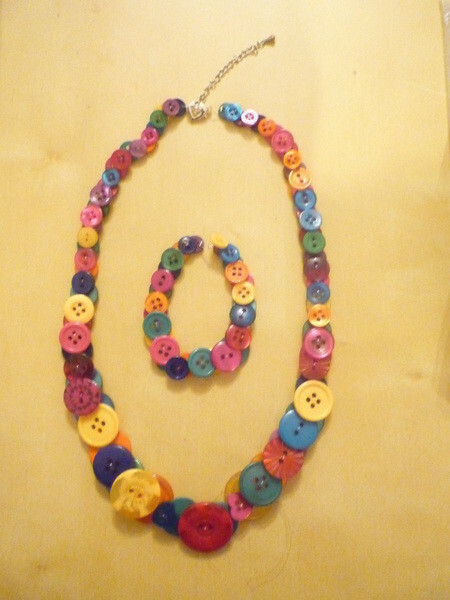 A bright and colourful present! I made this for my friend for her 18th birthday. One of the picture shows the bracelet that goes with it. It was really easy to make - a lot of people have problems with buttons lying properly, but all you need to do is double up the buttons, weave in and out and steadily increase and decrease them. You can see in the third picture the heart clasp I used which I absolutely loved! I want to hear from you guys, would you buy something like this if I were to sell it online? Unfortunately I don't have pictures but I'll try to explain what I did. The trick with getting this one to lie flat is that you double up the buttons. I used elastic beading thread, quite a thick one and would put it up through one hole and down through the other. Once one is on you put a button on the other way round, so that the bottoms of each are touching, and they will layer up. I laid out the buttons first so that it goes from small to big gradually, but you could probably do this while working. For the ends I just doubled over the elastic thread and crimped it shut so I was left with a loop. 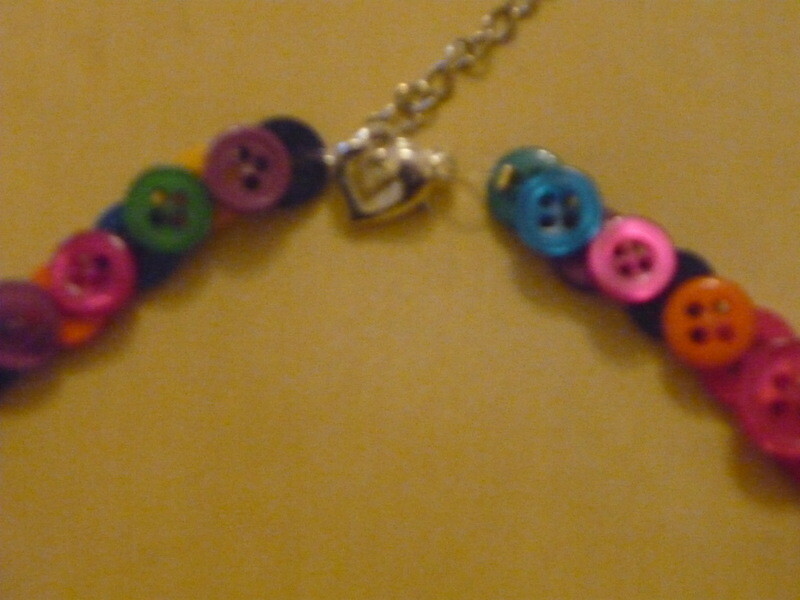 I then added a jump ring to each end and a heart clasp on one of those jump rings. I've made a couple of these in different colours now, the shop I work in sells packs of mixed buttons for £3 that you can get at least two of these necklaces out of, occasionally a bracelet as well. If anyone wants one I'm happy to sell through here. 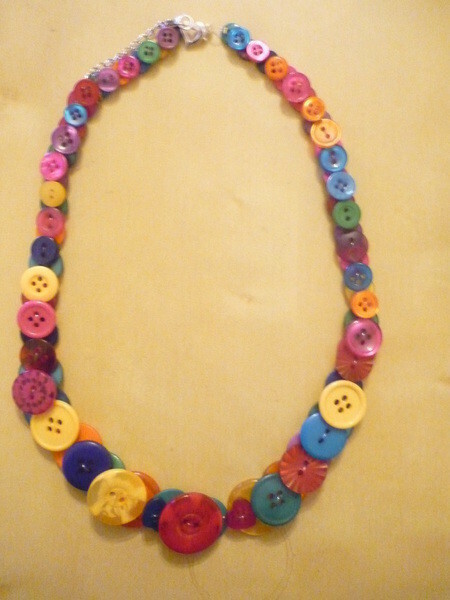 I am making button necklaces. I am using simple 2-hole shirt buttons and would like to get some more. 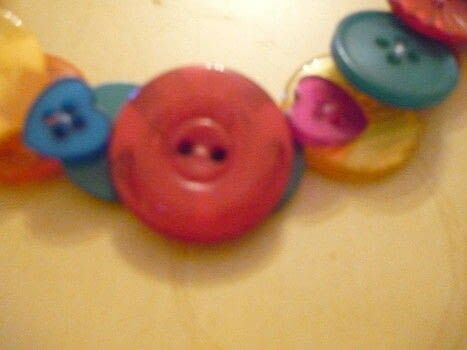 Does anyone know of a website where I can order buttons in bulk? I saw this and had to go to Wal-Mart to get buttons ASAP (I make button rings so mine were all used up). This is such a cute idea! I think I got it right, but I'm not sure. I mean...it's holding together! I wish it were more clear/photographed. Great job, anyway! if the price was right it looks very cute! Well done!